The 5th Uttarakhand Spring Bird Festival from 9-11th March 2018, promises to reveal two hidden gems on Uttarakhand's incredible birding circuits: Thano Reserve Forest and Jhilmil Jheel Conservation Reserve. Thano Reserved Forest is located 24 km from Dehradun and 12 km from Jolly Grant Airport. Set amidst marvelous Sal forest, surrounded by scrub, agricultural fields, crisscrossed by numerous jungle trails, Thano is a haven for birdwatchers and nature lovers. Jhilmil Jheel Conservation Reserve is located 20 km from Haridwar, on the banks of the River Ganga. Apart from a wonderful site for wetland birds, it is the only location in Uttarakhand where the Barasingha can be seen. 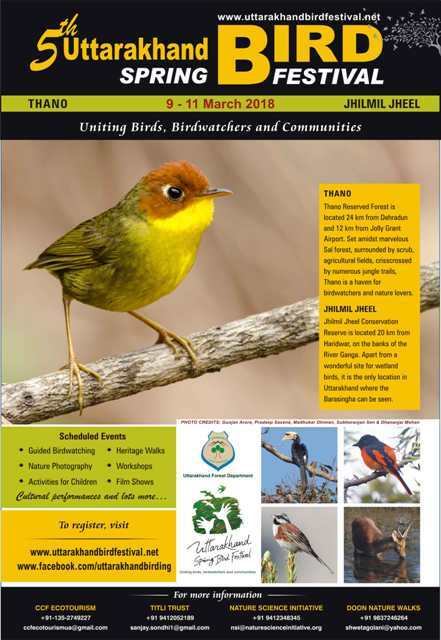 The main site for the 5th Uttarakhand Spring Bird Festival will be Thano where guided birdwatching, heritage walks, photography workshops, film shows, activities for children, cultural performances and lots more will be conducted. At Jhilmil Jheel, guided birdwatching will be conducted. There are no charges for birdwatching; however, you will need to register yourself for the birdwatching trails. All the trails will begin at 0700 hrs and 1430 hrs. Separate birdwatching for schools and institutions is planned daily from 0900 to 1100 hrs. Schools and institutions wanting to go birdwatching may call Anchal Sondhi at +91 9412992728 for offline registration. A maximum of 25 people per institution can be permitted on the birdwatching trails.